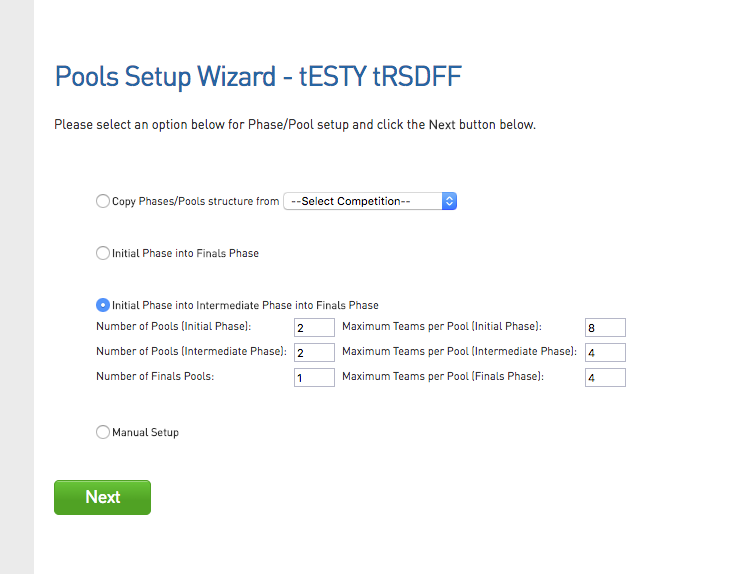 The Pools Competition Setup Wizard will guide administrators through the pools setup process. For information on how to create a competition, please see our create a competition article. We will focus on a Initial Phase into Finals Phase structure. Note: Ensure that the correct fixture templates (including finals fixture) for your competition have been established before you begin creating your competition. 1. Our competitions will feature 16 teams across 4 pools, with the top 2 teams in each pool moving to Quarter Finals, Into Semi-Final into Grand Final. 2. Once we have defined our structure, we can proceed to assigning our Rounds and Templates. 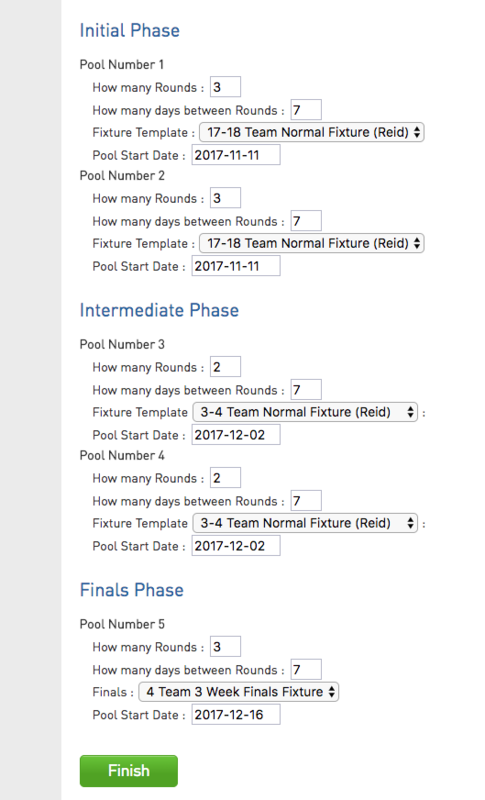 For this example, we will have 3 rounds for each of the 4 pools with round 7 days apart, and use a 3-4 Team Fixture Template. 3. We will also define our Finals structure in this screen. We will use a traditional Quarter,Semi and Grand Final structure. 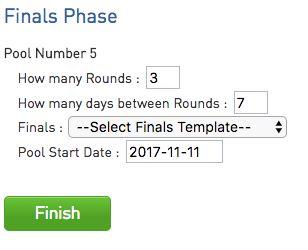 For example, it would be 3 rounds (referring to each finals stage) with 7 days in between the 3 stages of finals, using an 8 team- 3 week finals template. 4. Once your pools have been created you can add your teams to the competition and then assign these teams to each of the pools. Note: The teams have to be added to the competition itself first before they can be added to each of the pools. a. 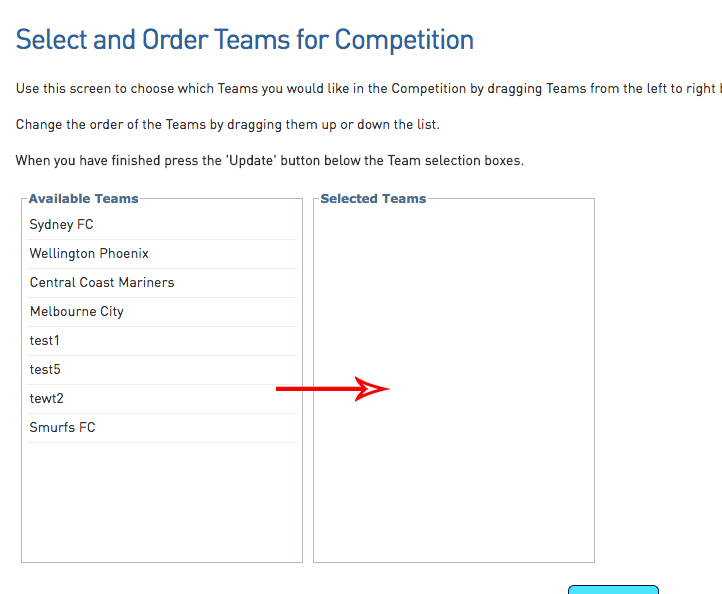 Go into the competition and select the Teams tab and add teams via the manage teams in competition. b. Once teams have been added to the competition, you can add them to each of the pools under the Teams tab next to each pool. Move each of the teams from the available team list to the selected team list. Note: only select the correct amount of teams that are in this one pool. As per our example, we are having 4 teams per pool, so we would select 4. 5. When setting up the fixtures for pools competitions, it is recommended that you use the venue time allocation grid to assign all your games to their relevant times and venues and then generate your fixture. 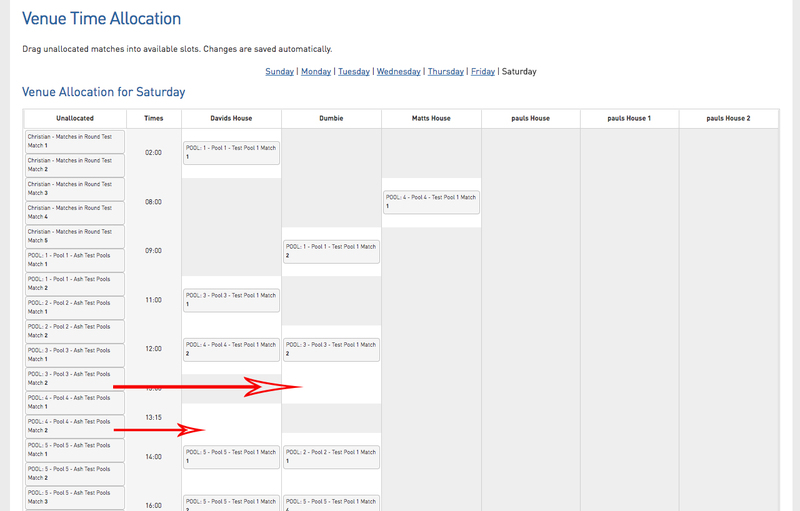 You will need to ensure the start times for your venues have been added as well before you assign any matches to the grid. Once your start times have been set up, all the venues in use should appear in the grid with all your matches for your competition in the unallocated box where you then drag them over into their designed time slots. 6. Now go into each of the pool of the competition and generate the fixtures. If the allocation grid has been done correctly what you assigned there should now be listed within the fixture. Manually update any matches if needed. 7. You will now need to create progression rules for each of the teams in order for them to move from Phase 1 to the Phase 2 (Finals Phase). Note: DO NOT run the progression rules until the end of the season when all rounds have been played, match results have been entered and the ladder is appearing correctly. The set up for this type of pools competition is set up exactly the same as the initial phase to finals phase but you would just create the progression rules for your teams going from the initial phase into the intermediate phase and then progression rules from the intermediate phase to the finals phase. 1. You will need to select the initial phase into Intermediate Phase into Finals Phase option when setting up the competition. We will use the same example as above: Our competitions will feature 16 teams across 4 pools, with the top 2 teams in each pool moving to Quarter Finals, Into Semi-Final into Grand Final. For this example, In the initial phase we have 2 pools of 8 teams (all 16 teams), in the intermediate phase we have 2 pools with 4 teams (only top 4 teams from initial) and then the finals phase we have 1 pool with 4 teams (only top 2 teams intermediate). 2. Repeat Steps 4-6 in the from the initial to finals phase set up. 3. When it comes to the progression rules for this type of competition, you will need to set them up twice. Once going from the initial phase to the intermediate phase and then again going from the intermediate phase into the finals phase. INITIAL TO INTERMEDIATE: When you create these progression rules be sure to only select the teams from the initial phase and select what pool the teams will be assigned into. INTERMEDIATE TO FINALS: When creating the progression rules be sure to only select teams from the intermediate phase. 4. Run the progression rules once rounds have finished in each phase and results have been entered. The manual set up options allows you to set up the competition yourself rather than going through the wizard. It is also used for those competitions that may have more than 3 phases. If you have had a pools competition set up in a previous season that you think you would like to use for your new season, you can select this option to copy the structure of that old competition for this new one. When copying this structure it WILL BRING over the PROGRESSION RULES but IT WILL NOT include the TEAMS from that season. Question: I have teams displaying with a pool number in brackets what does that mean? If you can see that some of your teams have a pool number in brackets this simply means that the team used to be in that pool but was either re-graded or moved out of that pool at some point in time, whether it was before the season or during the season. It is a common assumption that administrators think that these teams are cross pool teams, when in fact they are not. We currently don't have the functionality in place for cross pool competitions set up. If you are wanting to set your competition up this way please get in contact with us and we will look into providing a work around.